There are few spectacles in tabletop gaming as awe-inspiring as a miniatures game full of nicely painted miniatures and well-made terrain. To the unexperienced, miniatures painting can be seen as a craft reserved for the talented or particularly dexterous… but it’s not! 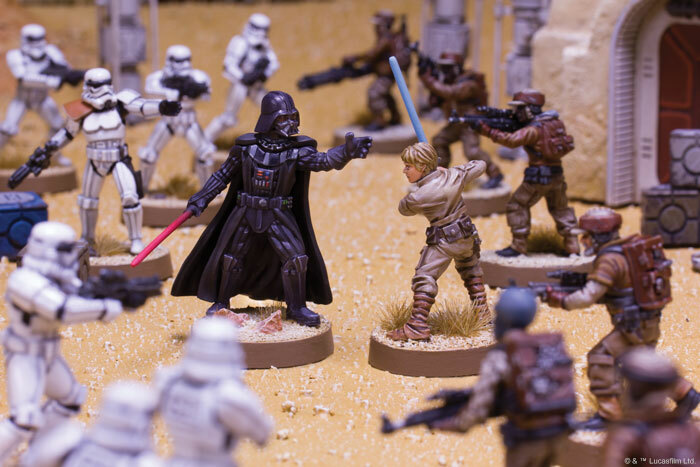 This article and the following one are intended to give you a solid overview of miniature painting and dispel the misconception that painting your Star Wars™: Legion miniatures is out of your reach. You can pre-order your own copy of the Star Wars: Legion Core Set at your local retailer or online through our webstore today! 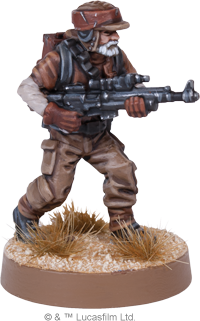 Then, read on for more information on how you can get started painting your Star Wars: Legion collection. Miniatures painting is done almost exclusively with acrylic paints. Acrylic paints have good coverage, dry quickly, can be thinned with water, and are non-toxic. These paints are readily available and relatively cheap. You can paint your miniatures with acrylics from craft stores or art supply stores, but in general, paints specifically designed for miniature painting (of which there are quite a few choices) will produce the best results. 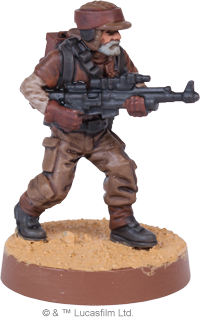 Before painting your miniatures, there are a few steps of preparation that will ensure a better end result. These steps will be covered in more detail later, but generally speaking, cleaning any imperfections away with a hobby (X-Acto) knife and applying a coat of spray primer are the steps that should be taken before putting paint to any miniature. From left to right: primed, basecoated, washed, layered, detailed. The miniature above shows the progression through these steps. Now that we’ve covered the broad strokes, let’s talk about materials! 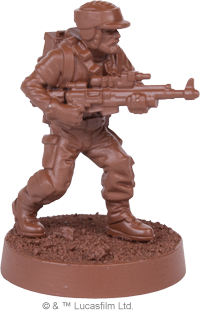 Materials for painting your miniatures can be purchased at a number of locations. Many game stores have paint racks and materials used specifically for miniature painting, but several items featured below can also be found at home improvement stores or craft stores. Model train stores also tend to have a huge variety of materials perfect for miniatures painting if you are fortunate enough to have one nearby. Star Wars: Legion miniatures should be assembled with superglue. Plastic cement will not cause the pieces to bond properly, as they are made of plastic that’s incompatible with plastic cement. White glue or other adhesives do not dry quickly enough, do not provide a strong bond, and are messy to use. 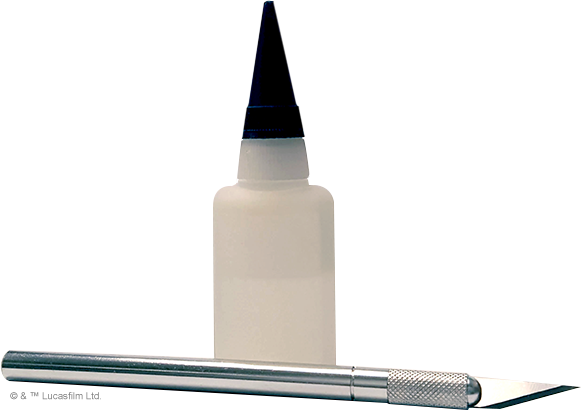 We recommend superglue that comes in a bottle with a fine applicator tip. Superglue made by paint or games manufacturers is generally the best to use. 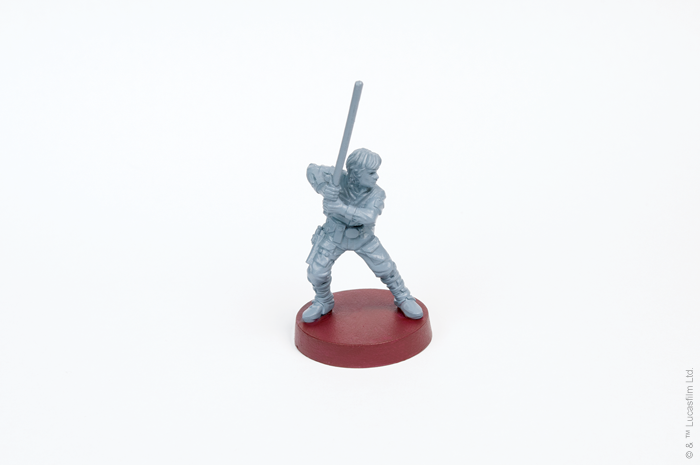 Clean-up of your miniatures should be done with a sharp hobby knife that has a replaceable blade. From time to time, mold lines and other materials are left on the miniature from the casting process. This will result in a seam around the miniature that would only be accentuated with painting. Using a hobby knife to trim away excess plastic will result in a better overall finish and is well worth the time. 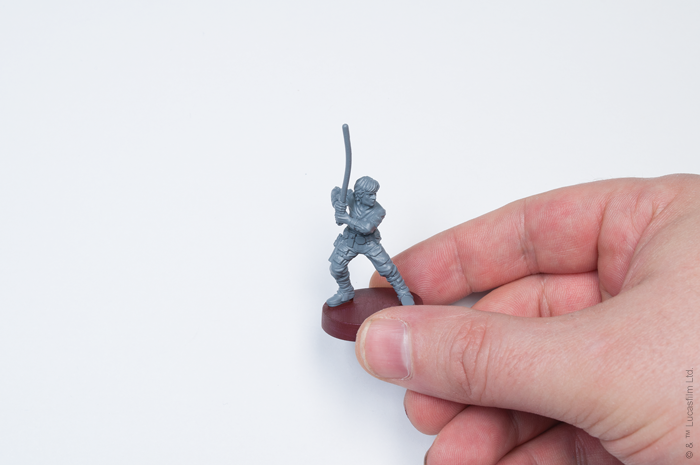 Some miniatures may come with slightly bent components from being packaged. 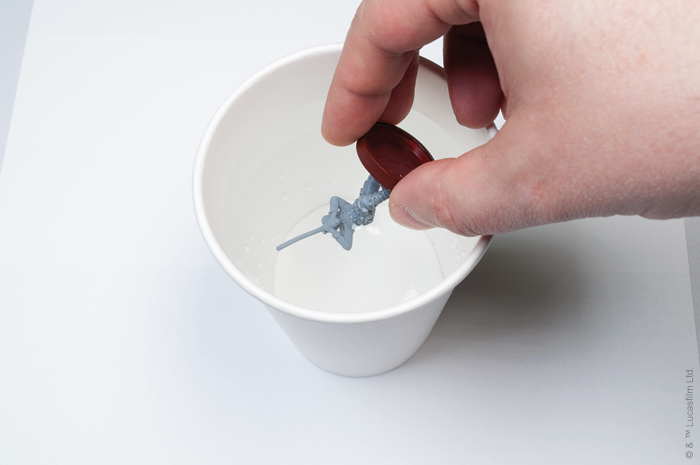 If this occurs, submerging the component in hot water for thirty seconds to soften the plastic will allow you to straighten the component to its proper angle. I typically microwave a mug filled with water for two minutes to get water that is hot enough to make this process easy. This Luke Skywalker has a bent lightsaber from being packaged. Immerse the miniature in hot water for thirty seconds. Straighten the bent component by hand. The lightsaber has now been perfectly straightened! Spray priming is an important step to ensure the durability and proper coverage of your paints. Spray primers can be purchased at any home improvement store, but be sure that you select a primer with a “flat” finish (not satin or glossy) and make sure that you are using a proper primer and not simply a spray paint. The word “primer” should be on the can. Again, your local gaming store that carries painting supplies should have primers specifically designed for painting miniatures. It’s your choice what color to prime with, though it is recommended you prime with a white or light grey primer if your painting scheme is largely white or brightly colored (like Stormtroopers). All other miniatures usually benefit from a dark or black spray primer as the recesses will be dark, which will make your paint job look more natural if you miss any recessed detail after you base coat and highlight the miniature. 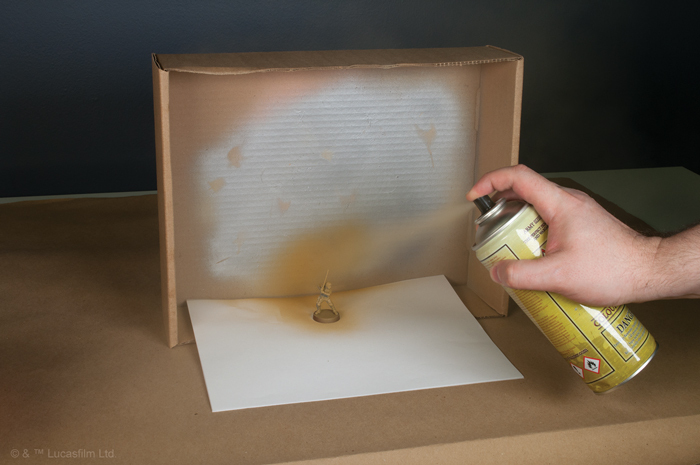 You will need a box or other disposable backdrop for your priming to catch the overspray from the spray can. We suggest putting a piece of paper in the bottom of the box and placing your miniatures on top so you can rotate the miniatures to spray them with primer from multiple angles. More advice on priming your miniatures will be covered later. A good set of brushes is the most vital part of your painting materials. It is well worth the cost to spend a little more for a better brush. 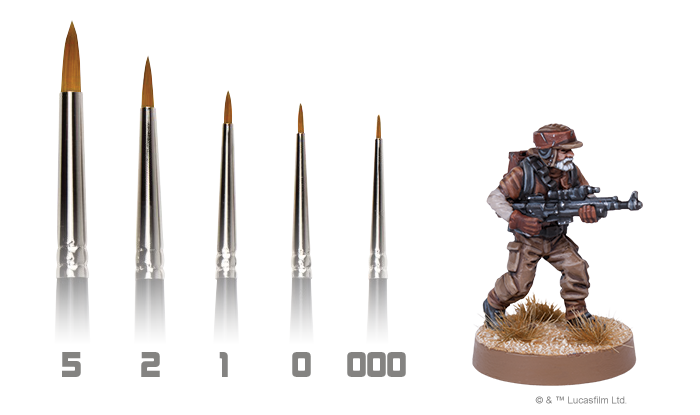 The best brushes for miniatures painting typically have kolinsky sable bristles. Avoid synthetic or plastic bristles—these brushes do not hold a fine tip through continued use. Typically brushes with a fine tip and shorter bristle length will allow for greater control and are ideal for beginners. There are a number of brush manufacturers that make great brushes for painting, and simple internet search will produce a wealth of options. Most brushes are sized with a numeric system. The brush size goes up with the number associated with the brush. A Size 000 is typically the smallest brush (one that would be used for tiny details like buckles, eyes, and the like) while a Size 2 brush will be used for most base coating and layering (techniques detailed later). What is comfortable for a painter will vary from person to person, but starting off with a Size 0 and a Size 2 is a good place to start. 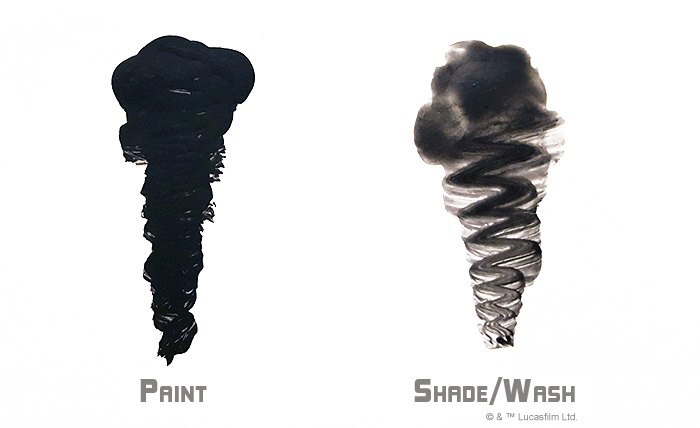 A larger brush, usually about 1/8” wide, is good for drybrushing, which is another technique we will discuss later. Care and proper cleaning of your brushes is important to lengthen the livelihood of your brushes. Brush soap from a crafts or art supply store is a good investment. Wash your brushes with the soap after each painting session, paying particular attention to any paint that gathers around the ferrule of the brush. (The ferrule is the metal casing that holds the bristles to the brush handle.) Dried paint that collects at the base of the bristles around the ferrule is the most common cause for a brush to become frayed and unusable for painting miniatures. The other obvious material to have when painting miniatures is the paints themselves! As mentioned before, most paints should be acrylic, water soluble, and designed for miniatures painting. Aside from standard colors, manufacturers also make a number of specialized paints used for specific tasks. Basecoat paints - These paints tend to have a higher pigment count and are slightly thicker than average acrylics. They provide great coverage and are often the paints of choice when applying the first layers of your paint job. These often need to be thinned slightly for an even coat. Metallics - These paints have tiny metallic flakes in them and are ideal for painting metallic surfaces like weapons, armor and the like. When dry, they have a slightly reflective finish, just like real metal. These paints often need to be shaken up prior to use to evenly distribute the metallic flake. Shades / Washes - These paints are very watery and semi-transparent, almost like coffee. They are intended to be painted into the recesses to add definition and shading to a miniature. As these paints are largely transparent and thin, they pool in the recesses and usually leave the raised areas untouched. Of all the paint types listed here, Shades and Washes are often regarded as giving the most dramatic and effective results and should certainly be part of your painting arsenal. Varnishes - The final paint on this list is not a paint per se, but a way to protect your paint job. Varnishes can be applied through a spray can, via airbrush, or by hand. Generally, you want a varnish with a matte finish. This will make your paint job look more natural and reduce glare. Some units, like Stormtroopers, have a glossy finish to their armor plates. In this case, a gloss varnish can be applied to make their armor look shiny. As the entirety of a Stormtrooper is not glossy, and there are areas where you will want a matte finish, this step is best applied by hand to the armor plates with a brushable gloss varnish. That covers our overview to painting, the steps often employed, and the materials typically used when painting miniatures! Keep watching our website and social media channels for more information on painting techniques and suggestions on how to get your Star Wars: Legion Core Set onto the tabletop and looking great in record time. 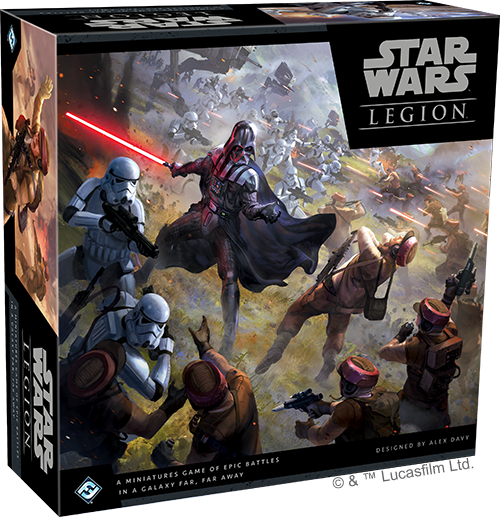 You can pre-order your own copy of the Star Wars: Legion Core Set (SWL01) at your local retailer or online through our website today!